Are you ready for the Boise Music Festival? We've provided all the information you should need to make it a great day of music and fun. This year's Boise Music Festival is on Saturday, June 24th from 10 a.m. to 10 p.m. It will take place rain or shine! The Boise Music Festival takes place at Expo Idaho in Boise each year. Parking is FREE at Boise Music Festival! The Boise Music Festival would like offer you several options for parking. There is free parking in the Expo Idaho lots off of Chinden Boulevard and Glenwood Avenue. These are first come first served. Click here for directions to Expo Idaho. Rideshare pick up and drop offs are also available - drive right on up to our main entrance! You probably know to bring your sunscreen, blanket or chair, small camera or phone, and maybe even some earplugs for when we really rock out. But, what shouldn't you bring? Please check out the Boise Music Festival Rules before packing up for the festival. 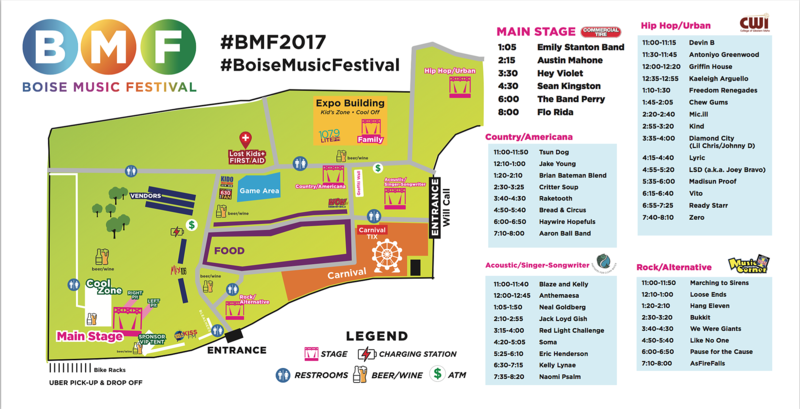 Whether you need to make your way to a local stage or the main stage to see your favorite singer or spend some time with your favorite DJ at a station tent, know where you're going with the Boise Music Festival map. There will be plenty of help to make your day at the festival safe and secure. You can find help in the security/medical area, or find security personnel in bright yellow or Boise Music Festival employees in green t-shirts to help you. You can view all main stage performers HERE! Check out all of our local stage performers HERE!